Who to start on Friday? Saunders, Johnson, or Hammel? The following post is from Phil Backert, a former producer of The Rob Long Show on Baltimore’s Fox1370, current associate producer on SiriusXM Fantasy Sports Radio, and die-hard O’s fan for life. Phil’s work will be appearing regularly here at the Nest. Follow Phil on twitter at @PhilBackert. After manager Buck Showalter elected to start Chris Tillman in the last regular season game against the Tampa Bay Rays, Oriole fans immediately turned their attention to who would start the tiebreaking game against the New York Yankees if needed on Thursday night, or the AL Wild Card game Friday night against the Texas Rangers. The candidates appear to be rookie Steve Johnson or eight-year vet Joe Saunders. On the surface it appears to be an easy decision; choose the veteran who has been through the ups and downs and has pitched in more pressurized situations. However, looking deeper into the situation, it may not be as easy as someone would think. Johnson, the local product, the pitcher who could have decided on June 1st to opt out of his contract if he was not added to the 40-man roster and leave the organization he rooted for as a child, the organization his father pitched for, has been nothing but marvelous since he made his major league debut on July 15th. He has pitched to a 2.11 ERA in 38 1/3 innings, while striking out 46 and walking 18 as a starter and reliever. There would be nothing more gratifying for him, then taking the ball on Friday night with the opportunity to send the team he loved his entire life to a divisional round playoff against the hated Yankees. However, Saunders was brought in by Executive Vice President, Baseball Operations Dan Duquette for this sole reason. Duquette wanted to bring in more veterans down the stretch to help take the burden off the young players and show them what it takes to not only make it to the postseason, but succeed when they get there. This is also the reason Jim Thome and Randy Wolf were acquired. Saunders has also pitched admirably since coming from Arizona. His ERA with Baltimore is 3.63 in 44 2/3 innings, while striking out 23 and only walking eight. He has also pitched to a 3-3 record. The crafty lefty doesn’t wow anyone on the radar gun – the same can be said of Johnson – but at the end of day, when he hands the ball to Showalter, the Orioles have a great chance of winning that game. In October, in a win or go home scenario, that is hard to overlook. The problem with Saunders is this: in 6 career starts at Arlington against the Rangers, Saunders is 0-6 with a 9.38 ERA. He has also allowed 13 home runs. Overall, against the Rangers, Saunders is 3-7 with a 6.48 ERA and 15 homeruns given up. The positive? He hasn’t pitched against Texas since 2010 and in that start he pitched 7 innings, and allowed one earned run while striking out six. His postseason numbers aren’t much better. In four starts amounting to 18 innings, he is 0-1 with 6.00 ERA. Saunders has allowed 23 hits, 12 walks with a WHIP of 1.944. Obviously, as a rookie, Johnson has never pitched in this type of game, so Showalter, along with the rest of the team and the fans, don’t know how he will respond. The unknown could be a good thing. Maybe he is just too dumb to understand how big of a moment this is, or he thrives under these situations. Only Showalter can gauge this and that is what has made him such a great manager throughout his career – he knows the pulse of his team. The wild card in this – no pun intended – is Jason Hammel. Hammel threw a 73-pitch bullpen on Tuesday and declared himself ready whenever the team needed him. 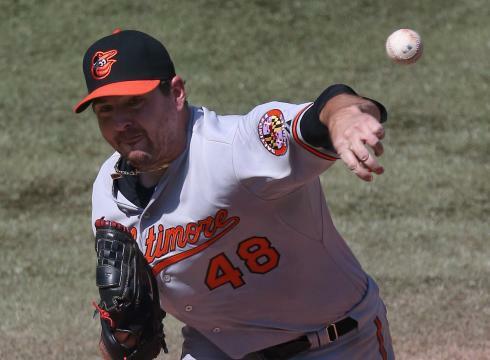 Showalter indicated that Hammel will be ready to pitch, “sometime this week.” All signs pointed to a Saturday start if the Orioles won the division because it would be on normal rest. That situation can not happen now, so Showalter must choose to hope the Orioles play Sunday so Hammel can return from his knee injury, or take a chance and let the best pitcher of the three go out there after not pitching since September 11th and gamble that he is physically ready to face a prolific Rangers lineup on short rest. This is a huge risk because it opens the door up for a lot of criticism if Hammel exits the game early because he isn’t healthy or is ineffective. Even with Showalter announcing on Tuesday that Hammel would not pitch before Saturday, it is something to keep an eye on. However, with this scenario being the longest of long shots, we return to Saunders or Johnson. Showalter trusts his veterans, sometimes to a fault. He believes that they have “been there, done that,” and that goes a long way when a player knows his manager backs him even if he is struggling at that moment. Duquette brought Saunders to Baltimore for this reason. In a perfect world, it would not be a loser-goes-home scenario or Miguel Gonzalez and Chris Tillman would be available or Hammel would be 100% healthy. However, this is the hand he was dealt, and I think Showalter leans toward the veteran to punch this team’s ticket back to Baltimore against their hated rival. This entry was posted on October 4, 2012 at 12:42 pm and is filed under Orioles. You can follow any responses to this entry through the RSS 2.0 feed. You can skip to the end and leave a response. Pinging is currently not allowed.